Lamb’s quarters are an old-time pasture tonic herb, which improves digestion and is a great tonic for the whole digestive system. It is high in protein, calcium, and vitamin A, and mineral rich. The seeds are edible and high in protein as well. 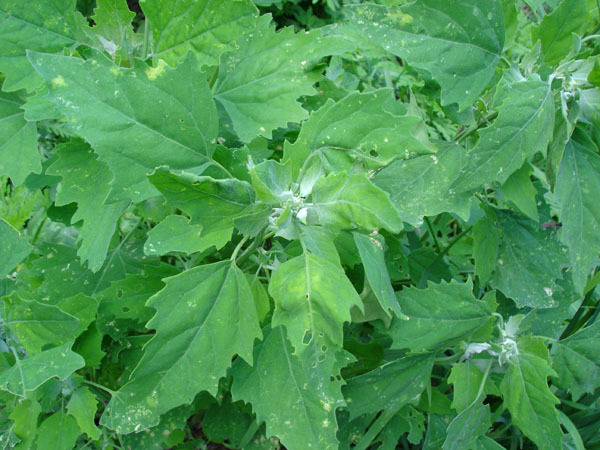 Lamb’s quarters grows in USDA Zones 3 to 5, and prefers full sun. It is an annual, and can grow 3 to 6 feet tall. The leaves are soft, slightly downy with mucilaginous leaves, like spinach. The flowers are green-white. Fresh/free choice. Let it grow freely as a weed!